A large hand-carved sculpture of the Sphinx. 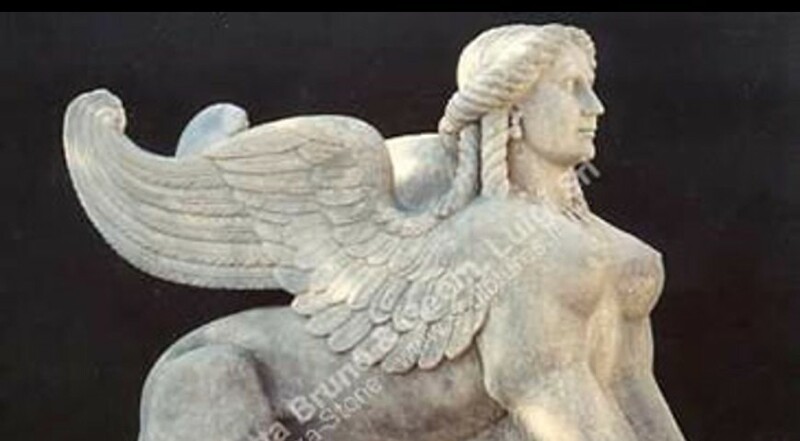 A sphinx is a mythical creature with a lion's body and a human head or a cat head.The sphinx, in Greek tradition, has the haunches of a lion, the wings of a great bird, and the face of a woman. The name 'sphinx' which means 'strangler' was first given by the Greeks to a fabulous creature which had the head of a woman and the body of a lion and the wings of a bird. She is mythicised as treacherous and merciless. Those who cannot answer her riddle suffer a fate typical in such mythological stories, as they are killed and eaten by this ravenous monster.Unlike the Greek sphinx which was a woman, the Egyptian sphinx is typically shown as a man (an androsphinx). In addition, the Egyptian sphinx was viewed as benevolent in contrast to the malevolent Greek version and was thought of as a guardian often flanking the entrances to temples.